Fifth-grader Dietrich Irving (center), listens to both his grandmother Dorothy Holley (left) and Sister Roberta Fulton (right) during a parent conference at Our Mother of Mercy Catholic School on November 29, 2001. Sister Roberta is the first black principal and nun at the oldest African-American parochial school in Fort Worth. 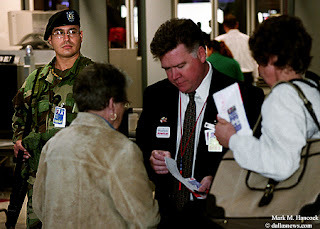 PFC F. Llaguno (left) of the Texas National Guard maintains an armed presence while American Airlines ground security coordinator David Sapp (right) checks passengers for boarding passes and identification before they continue to security screening at DFW International Airport on November 19, 2001. The airport released the results of a survey of wait times at ticketing and checkpoints such as this. 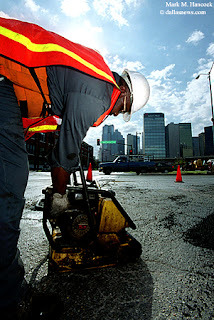 James Dickey, a street repairer for the City of Dallas, prepares to flatten asphalt in the intersection of Live Oak Street and Good-Latimer Expressway near downtown Dallas on November 2, 2001. The pothole patrol could add six trucks to its existing fleet of nine trucks. Truck workers also handle street closures for city events such as marathon runs and parades on holidays.